© Hans Decoz -2019. All rights reserved. The influence of numbers around you can be without measurable effect or contribute to the difference between success and failure. Numerology consultations usually focus on a client’s personal numbers. However, when someone asks for advice regarding a move to a different address or wonders whether their license plate is “unlucky,” or their phone number is favorable, the focus shifts from the numbers in their personal chart, to numbers that exist around them. I have always considered this interesting, because the link between an individual and the inanimate objects in their orbit puts a spin on the fact that numerology is based on patterns. The reality is, numbers produce an effect in people’s perception. Numbers by themselves do nothing - they don’t send out rays or waves of any kind. Actually, they don’t even exist. Numbers are symbols and, like all symbols, they create a perception beyond their actual meaning. The number 7, for example, feels different and produces a different effect than the number 8. This perception isn’t based on whether a person favors one number over another; rather, the impression numbers carry has become embedded in our psyche over time - since we began using them thousands of years ago. Numerology is based on the fact that numbers have taken on personalities in our perception. Numbers, letters, and other symbols represent detectable patterns such as dates, words, concepts, and belief systems. Patterns are linked to symbols that are linked to our interpretation of their personalities. Et voila - you have the basis, in part anyway, for the age-old science of numerology. 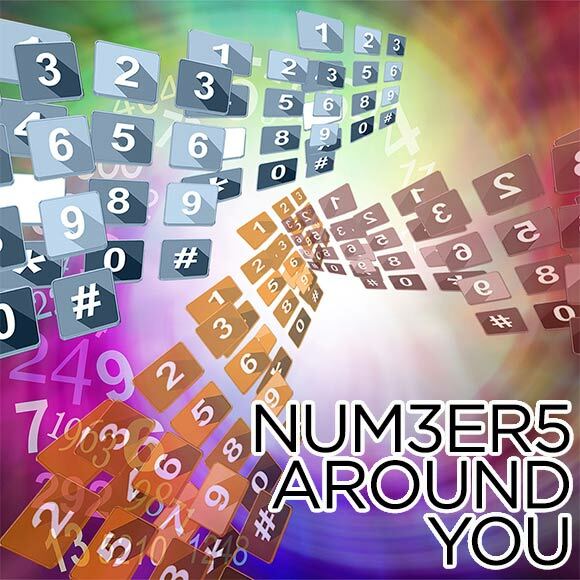 The numerology of numbers around you - your home or business address, phone number, car license plate, social security number - all affect you. The challenge is understanding how and when these symbols affect you. Your street address, of course, influences your home’s atmosphere. But because it is a minor aspect, the influence is by no means decisive. For example, if your address adds to 7, indicating a quiet, in-ward focused, scholarly, and serious influence, but you live there with five rowdy teenage kids and a couple pets, the influence of the 7 will be minimal. Conversely, if a somewhat introverted single individual moves to that address, the 7’s influence could significantly increase that person’s tendency to withdraw. Similarly, if a phone number adds to 3 (numerology meaning verbal, fun) and it contains a few 2’s (good with people) and 9’s (artistic, sophisticated), it would be favorable for a hair salon but not great for a construction company. But, if the hair salon is not well managed or is in a bad location, all the 2’s, 3’s, and 9’s in the world won’t save it. And if the construction company is well managed, run by smart, ambitious people, the phone number won’t make a measurable difference. If it’s just hanging in there, a bad phone number might be the straw that breaks the camel’s back. Depending upon the placement of the numbers around you, they carry a stronger or weaker affect. Unless you often move from place to place, your address will have a stronger effect on how you feel (comfort, security) than your phone number. And your phone number will have a greater effect on your social and business contacts. The latest trend, and something I receive numerous questions about, is how the recurring numbers we notice affect us. Since the digital revolution, we “see” the time of day in a way we didn’t when we only had analogue clocks. So, what does it mean when you see the numbers 1:11, or 2:22, or 5:55 often enough to make a mental note about it? Many people call these Angel Numbers – numbers that are relaying specific messages depending on the number. Maybe you keep seeing the number 6 - on receipts, billboards, in a group of numbers, or in a movie. Although each of these events are “fleeting” occurrences (a particular number is not likely to “follow you around” for weeks or months), the fact that you notice them is something to pay attention to. When you see a digital clock with the same three numbers in a row - say, 2:22 – look up the numerology traits of the number 2 to ponder the message it is sending. The 2 concerns itself with relationships, cooperation, and sensitivity – you might ask yourself how that relates to current concerns or issues in your life. You may also want to consider the 22 Master number as a distinct part of this 3-digit number. For added depth, add the three numbers to reduce them to a single digit. In the example above this would be 2 + 2 + 2 = 6. As you can see, the influence of the numbers around you can be without measurable effect or impact the difference between success and failure. My advice? You might as well take it into account when you can – it can’t harm, and it could be quite beneficial.